The gearless advantage. 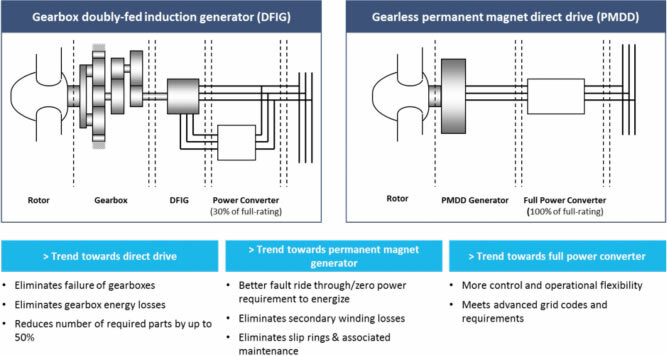 By eliminating a failure-prone gearbox, permanent magnet direct-drive (PMDD) technology requires fewer components with only one moving part in the drivetrain, further reducing the lifetime maintenance costs of the turbine. The end result is less downtime, meaning an overall increase in turbine availability and increased energy production. A permanent magnet generator further boosts Goldwind’s advantage. Eliminating the need for rotor winds, slip windings, slip rings, brushes, and associated maintenance makes the turbine more reliable than a direct drive machine running on wound rotor excitation technology. High power generating efficiency. Permanent magnet direct-drive (PMDD) turbine generators avoid rotor winding losses and mechanical energy losses associated with gearboxes and couplings. The full power converter provides the flexibility to optimize rotor rotational speed for maximum mechanical energy transformation.